I love a mystery… especially a local search ranking mystery I can solve for someone. Now, the truth is, some ranking puzzles are so complex, they can only be solved by a formal competitive audit. But there are many others that can be cleared up by spending 15 minutes or less going through an organized 10-point checklist of the commonest problems that can cause a business to rank lower than the owner thinks it should. 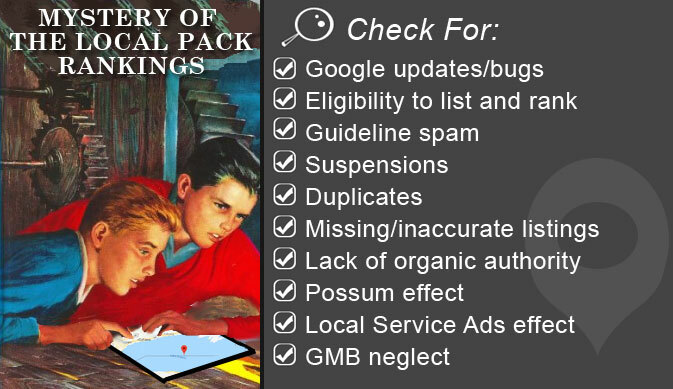 By zipping through the following checklist, there’s a good chance you’ll be able to find one or more obvious “whodunits” contributing to poor Google local pack visibility for a given search. Since I wrote the original version of this post in 2014, so much has changed. Branding, tools, tactics — things are really different in 2018. Definitely time for a complete overhaul, with the goal of making you a super sleuth for your forum friends, clients, agency teammates, or executive superiors. Let’s emulate the Stratemeyer Syndicate, which earned lasting fame by hitting on a simple formula for surfacing and solving mysteries in a most enjoyable way. Before we break out our magnifying glass, it’s critical to stress one very important thing. The local rankings I see from an office in North Beach, San Francisco are not the rankings you see while roaming around Golden Gate park in the same city. The rankings your client in Des Moines sees for things in his town are not the same rankings you see from your apartment in Albuquerque when you look at Des Moines results. With the user having become the centroid of search for true local searches, it is no mystery at all that we see different results when we are different places, and it is no cause for concern. And now that we’ve gotten that out of the way and are in the proper detective spirit, let’s dive into how to solve for each item on our checklist! The first thing to ask if a business experiences a sudden change in rankings is whether Google has done something. Search Engine Land strikes me as the fastest reporter of Google updates, with MozCast offering an ongoing weather report of changes in the SERPs. Also, check out the Moz Google Algo Change history list and the Moz Blog for some of the most in-depth strategic coverage of updates, penalties, and filters. For local-specific bugs (or even just suspected tests), check out the Local Search Forum, the Google My Business forum, and Mike Blumenthal’s blog. See if the effects being described match the weirdness you are seeing in your local packs. If so, it’s a matter of fixing a problematic practice (like iffy link building) that has been caught in an update, waiting to see how the update plays out, or waiting for Google to fix a bug or turn a dial down to normalize results. *Pro tip: Don’t make the mistake of thinking organic updates have nothing to do with local SEO. Crack detectives know organic and local are closely connected. Does the business make face-to-face contact with its customers? What city is the business in? What is the exact keyword phrase they are hoping to rank for? If the answer is “no” to either of the first two questions, the business isn’t eligible for a Google My Business listing. And while spam does flow through Google, a lack of eligibility could well be the key to a lack of rankings. For the third question, you need to know the city the business is in so that you can see if it’s likely to rank for the search phrase cited in the fourth question. For example, a plumber with a street address in Sugar Land, TX should not expect to rank for “plumber Dallas TX.” If a business lacks a physical location in a given city, it’s atypical for it to rank for queries that stem from or relate to that locale. It’s amazing just how often this simple fact solves local pack mysteries. If any of the above conundrums are new to you, definitely spend 10 minutes reading the guidelines. Make flash cards, if necessary, to test yourself on your spam awareness until you can instantly detect glaring errors. With this enhanced perception, you’ll be able to see problems that may possibly be leading to lowered rankings, or even… suspensions! If the listing was formerly verified, but has mysteriously become unverified, you should suspect a soft suspension. Soft suspensions might occur around something like a report of keyword-stuffing the GMB business name field. Oddly, however, there is little anecdotal evidence to support the idea that soft suspensions cause ranking drops. Nevertheless, it’s important to spot the un-verification clue and tell the owner to stop breaking guidelines. It’s possible that the listing may lose reviews or images during this type of suspension, but in most cases, the owner should be able to re-verify his listing. Just remember: a soft suspension is not a likely cause of low local pack rankings. If the listing’s rankings totally disappear and you can’t even find the listing via a branded search, it’s time to suspect a hard suspension. Hard suspensions can result from a listing falling afoul of a Google guideline or new update, a Google employee, or just a member of the public who has reported the business for something like an ineligible location. If the hard suspension is deserved, as in the case of creating a listing at a fake address, then there’s nothing you can do about it. But, if a hard suspension results from a mistake, I recommend taking it to the Google My Business forum to plead for help. Be prepared to prove that you are 100% guideline-compliant and eligible in hopes of getting your listing reinstated with its authority and reviews intact. Notorious for their ability to divide ranking strength, duplicate listings are at their worst when there is more than one verified listing representing a single entity. If you encounter a business that seems like it should be ranking better than it is for a given search, always check for duplicates. While you’ve got Moz Check Listing fired up, pay attention to anything it tells you about missing or inaccurate listings. The tool will show you how accurate and complete your listings on are on the major local business data aggregators, plus other important platforms like Google My Business, Facebook, Factual, Yelp, and more. Why does this matter? Google can pull information from anywhere on the web and plunk it into your Google My Business listing. While no one can quantify the exact degree to which citation/listing consistency directly impacts Google local rankings for every possible search query, it has been a top 5 ranking factor in the annual Local Search Ranking Factors survey as far back as I can remember. Recently, I’ve seen some industry discussion as to whether citations still matter, with some practitioners claiming they can’t see the difference they make. I believe that conclusion may stem from working mainly in ultra-competitive markets where everyone has already got their citations in near-perfect order, forcing practitioners to look for differentiation tactics beyond the basics. But without those basics, you’re missing table stakes in the game. Indirectly, listing absence or inconsistency impacts local rankings in that it undermines the quest for good local KPIs as well as organic authority. Every lost or misdirected consumer represents a failure to have someone click-for-directions, click-to-call, click-to-your website, or find your website at all. Online and offline traffic, conversions, reputation, and even organic authority all hang in the balance of active citation management. Turn the MozBar on by clicking the little “M” at the top of your browser so that it is blue. Perform your search and look at the first few pages of the organic results, ignoring anything from major directory sites like Yelp (they aren’t competing with you for local pack rankings, eh?). Note down the Page Authority, Domain Authority, and link counts for each of the businesses coming up on the first 3 pages of the organic results. Finally, bring up the website of the business you’re investigating. If you see that the top competitors have Domain Authorities of 50 and links numbering in the hundreds or thousands, whereas your target site is well below in these metrics, chances are good that organic authority is playing a strong role in lack of local search visibility. How do we know this is true? Do some local searches and note just how often the businesses that make it into the 3-pack or the top of the local finder view have correlating high organic rankings. Where organic authority is poor, a business has a big job of work ahead. They need to focus on content dev + link building + social outreach to begin building up their brand in the minds of consumers and the “RankBrain” of Google. One other element needs to be mentioned here, and that’s the concept of how time affects authority. When you’re talking to a business with a ranking problem, it’s very important to ascertain whether they just launched their website or just built their local business listings last week, or even just a few months ago. Typically, if they have, the fruits of their efforts have yet to fully materialize. That being said, it’s not a given that a new business will have little authority. Large brands have marketing departments which exist solely to build tremendous awareness of new assets before they even launch. It’s important to keep that in mind, while also realizing that if the business is smaller, building authority will likely represent a longer haul. If the answer is “yes,” search for the business’ desired keyword phase and look at the local finder view in Google Maps. Note which companies are ranking. Then begin to zoom in on the map, level by level, noting changes in the local finder as you go. If, a few levels in, the business you’re advising suddenly appears on the map and in the local finder, chances are good it’s the Possum filter that’s causing their apparent invisibility at the automatic zoom level. Google Possum rolled out in September 2016, and its observable effects included a geographic diversification of the local results, filtering out many listings that share a category and are in close proximity to one another. Then, about one year later, Google initiated the Hawk update, which appears to have tightened the radius of Possum, with the result that while many businesses in the same building are still being filtered out, a number of nearby neighbors have reappeared at the automatic zoom level of the results. If your sleuthing turns up a brand that is being impacted by Possum/Hawk, the only surefire way to beat the filter is to put in the necessary work to become the most authoritative answer for the desired search phrase. It’s important to remember that filters are the norm in Google’s local results, and have long been observed impacting listings that share an address, share a phone number, etc. If it’s vital for a particular listing to outrank all others that possess shared characteristics, then authority must be built around it in every possible way to make it one of the most dominant results. And if the answer is “yes,” then brace yourself for ongoing results disruption in the coming year. SABs who haven’t signed up for LSA being removed from 3-packs and relegated to no-man’s land at the bottom of ad units. Suffice it to say, rollout to an ever-increasing number of cities and categories hasn’t been for the faint of heart, and I would hazard a guess that Google’s recent re-brand of this program signifies their intention to move beyond the traditional SAB market. One possible benefit of Google getting into this type of lead gen is that it could decrease spam, but I’m not sold on this, given that fake locations have ended up qualifying for LSA inclusion. While I honor Google’s need to be profitable, I share some of the qualms business owners have expressed about the potential impacts of this venture. Since I can’t offer a solid prediction of what precise form these impacts will take in the coming months, the best I can do here is to recommend that if an SAB experiences a ranking change/loss, the first thing to look for is whether LSA has come to town. If so, alteration of the SERPs may be unavoidable, and the only strategy left for overcoming vanished visibility may be to pay for it… by qualifying for the program. Verification status – While you can rank without verifying, lack of verification is a hallmark of listing neglect. Basic accuracy – If NAP or map markers are incorrect, it’s a sure sign of neglect. Category choices – Wrong categories make right rankings impossible. Image optimization – Every business needs a good set of the most professional, persuasive photos it can acquire, and should even consider periodic new photo shoots for seasonal freshness; imagery impacts KPIs, which are believed to impact rank. Review count, sentiment and management – Too few reviews, low ratings, and lack of responses = utter neglect of this core rank/reputation-driver. Hours of operation – If they’re blank or incorrect, conversions are being missed. Main URL choice – Does the GMB listing point to a strong, authoritative website page or a weak one? Additional URL choices – If menus, bookings, reservations, or placing orders is part of the business model, a variety of optional URLs are supported by Google and should be explored. Google Posts – Early-days testing indicates that regular posting may impact rank. Google Questions and Answers – Pre-populate with best FAQs and actively manage incoming questions. There is literally no business, large or small, with a local footprint that can afford to neglect its Google My Business listing. And while some fixes and practices move the ranking needle more than others, the increasing number of consumer actions that take place within Google is reason enough to put active GMB management at the top of your list. The Hardy Boys never went anywhere without their handy kit of detection tools. Their father was so confident in their utter preparedness that he even let them chase down gangs in Hong Kong and dictators in the Guyanas (which, on second thought, doesn’t seem terribly wise.) But I have that kind of confidence in you. I hope my troubleshooting checklist is one you’ll bookmark and share to be prepared for the local ranking mysteries awaiting you and your digital marketing colleagues in 2018. Happy sleuthing! The post An MP3 Website, Activist Community, A Craigslist-Copy Called Yaz.com.au And An English School – These Are My Failures And The Lessons Learned appeared first on Entrepreneurs-Journey.com. The post SearchCap: AdWords call tracking, SEO failures, & SERP tools appeared first on Search Engine Land.